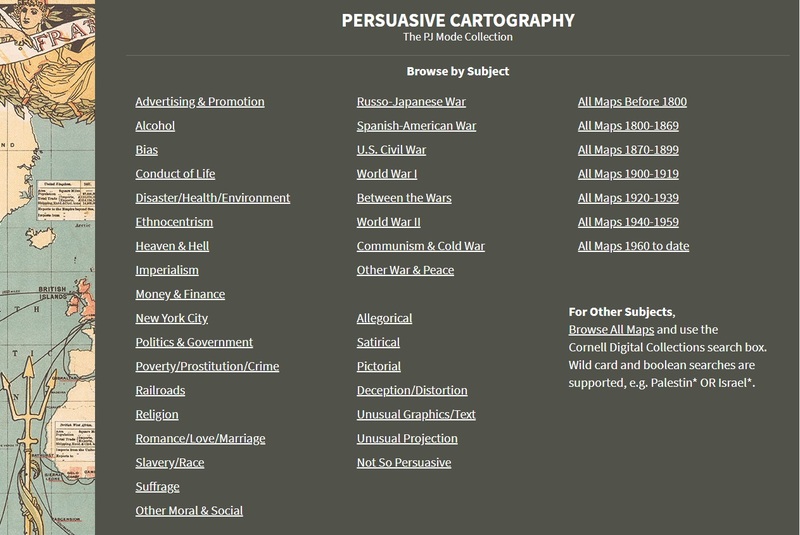 Continuing with the cartography as writing theme from the previous Persuasive Cartography post, today here’s a tool for using maps to create a narrative journey through a historical event, movement, or even a fictional story. 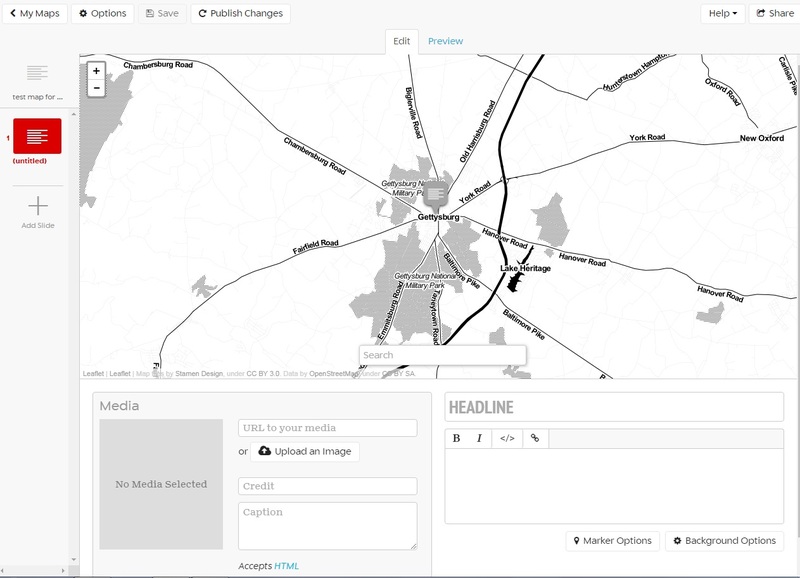 StoryMap JS allows students to create their own narrative story line through cartography where they are able to chart a path anywhere in the world using real places, from a very broad jump between nations down to actual street addresses. Have students use this tool to show understanding of the sequencing of events through history (i.e. the Lewis and Clark Expedition), to better visualize a work of fiction (for example, locations in On the Road), or even to create their own original work. StoryMap allows students to imbed content from YouTube, Wikipedia, GoogleMaps, SoundCloud, or even original images to tell their story. This can also be used as a stand alone alternative for collating resources on a topic with the added benefit of allowing readers to view the map and journey taken at the same time. There are wonderful tips and tricks for helping keep maps stories simple yet informative, and the creation interface is very simple and intuitive as well, making this a great alternative assessment for students as they don’t need to fully learn the tool before applying the content. Potential use in the classroom: As an alternative to reading, collation of resources, or an alternative student assessment. Recommended grade levels: 7-12 for creation, but any grade K-12 for simple visual learning. We all (or most of us) know about the concept of persuasive writing, as this is one of the major focuses in our Language Arts curriculum. Getting students to understand the power that words have to influence and sway opinion one way or another or to reinforce already held beliefs. But what about visual representations of the same concepts? What’s also nice is each map in the collection is able to be downloaded for use in the classroom, made into a poster or handout for tabletop activities, and fully sourced for citation purposes. 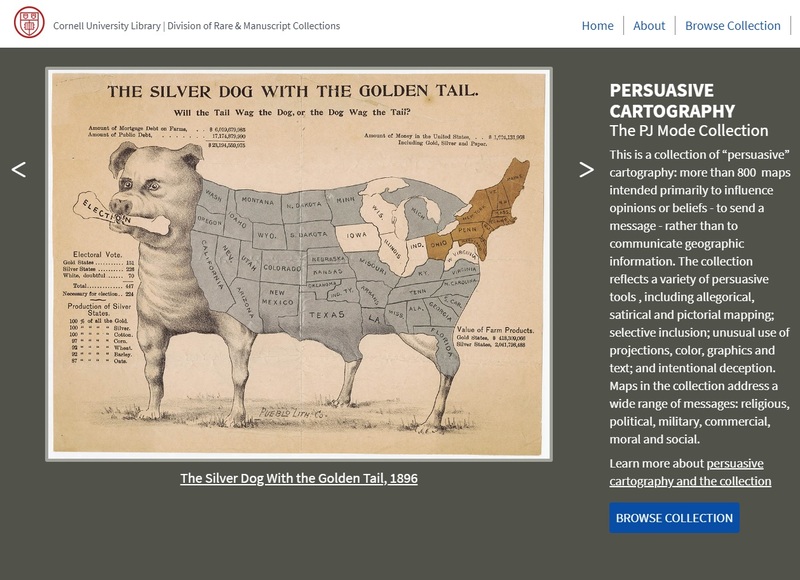 For more information, OpenCulture published an article detailing the collection and persuasive mapmaking as a whole that you might find informative. Potential use in the classroom: As a warm-up or discussion activity around historical events in your course, or as a discussion kickstarter for the topic of persuasion and propaganda. Every year I set at least one goal/resolution for myself. Big surprise, it’s to read more — or at least read! Each year since before I can remember, I have set a reading goal for myself, and while in the beginning when I was still in school, it was very low and only included pleasure reading (even if some of my history texts were pleasurable), I have incrementally increased my goal every year since. This year I’ve set a goal of reading 115 full length books, up from 2016’s goal of 110, a goal I feel that I barely eked out, thanks to lots of life events that prevented me reading as much as I would have liked. Back in the dark ages, I used to keep my lists by hand, and track the titles, authors, pages, etc. of all my books each year, but would end up inevitably losing or misplacing my notepad and having to try to guess and try to reconstruct my list or just plain make something up. That’s when I found Goodreads. Now, I am sure most of you are familiar with Goodreads as it’s been the most popular social network for readers and books for years, and even more so now that it has been acquired by Amazon, so I won’t get into the details. Just what I like about a feature I surprisingly did not know about until recently to help me decide what to read next since that’s always a problem for me! So if you’re like me, you are always on the lookout for new books and something new to read and always seem to have a never-ending pile or backlog of books on your “Want to Read” list. I can’t resist bookstores or the free and reduced e-book lists out there for Kindle. My favorites right now are BookGorilla (an email subscription for free and reduced books based on your genre preferences) and AtoZWire (scroll their list for the daily free Kindle deals). Unfortunately(?) this has left me with a “to read” list of over 1450 books!! My biggest problem was trying to remember what I had, and then deciding what to read next. I know there are always some books I will gravitate to, like superhero graphic novels (MARVEL!) or Star Wars books, but after reading something great, I struggle to find something new, or just in general I might want something new and different. This is where I found a neat trick to keep myself guessing. Two completely different lists! SURPRISE!! Now, you can pick and choose what you like from this first page, or what I have chosen to do is just take the top book on the list when I am ready. So, I’ll finish Inferno, which I’m currently reading, and unless there is something I need to read, I will jump to my “To Read” list and take what Goodreads gives me! I find this to be a big help, since I end up finding that I can’t stick to other reading suggestions or challenges that ask you to read certain books from certain categories, like the 52 book challenges you can find online. Even though my personal goal is nearly double that, I can’t force myself to read something I am not interested in, there’s too much I am interested in out there, and I will always fall short on those. Hopefully this little trick can help you find, or rediscover some of those “lost books” in your kindle or on your shelf that you forgot you were once interested in. I know that since I found this out myself, I have read some very fun books (and some not so fun ones), but always something I know that I wanted to read — even if it was three years ago! Let me know your challenge for yourself, if you have one! If you would like to follow along with my reading on Goodreads, you can find my profile here. Please feel free to follow me or send a friend request. Sticking with today’s theme of traffic and car related materials, Traffic Simulator gives you and your students a chance to see how slight changes in road systems, driving patterns, and other factors can lead to major back-ups on our roadways. The initial pattern on the website is a steady circle of traffic (ring road), and you can manipulate different factors such as the total number of cars on the road, the number of those that are trucks, and the acceleration of those vehicles to show how each affects the traffic in a closed system. Once you’ve played with that and messed up rush hour, you can try the other traffic patterns, such as adding an on-ramp (above), off-ramp, construction, hill, or detour to see how each can also change the traffic. Different elements can again be manipulated to test the roads and demonstrate how different factors can lead to traffic nightmares. Explanations of some of the physics and psychology of traffic are provided through the links on the sidebar, as well as different ways to use the simulation. Traffic Simulator is a wonderful tool for seeing how traffic patterns can shift and change and what affects them, as well as providing students with some problem solving as they work through how to alleviate the traffic and find the ideal conditions for each roadway. Geared toward middle grade students, EnviroMysteries provides a series of three video sets and interactive activities that help students understand various complex health and environmental issues that affect us all. Water + ? = Trouble: This module is a series of videos where students are able to watch the discovery of and investigation of a mysterious waterborne illness. As the investigation proceeds, students will learn about the properties of water, different waterborne illnesses, and the need for water purification in the face of increased pollution. Breaking the Mold: This video series traced the discovery of mold spores and the illnesses that result in the home. Students will learn how to identify mold when it appears in the home or other buildings and ways to remove the dangerous mold and prevent its spread and reoccurrence. Inside Stories: A fully interactive investigation that places students in the middle of a health center where four individuals are facing four very distinct and relevant health issues. Students can view each of the four stories and read through the problems, read supporting documents, and then help work out a solution for the problem. As they read and research, students are exposed to the health issues of skin cancer, the importance of a good diet, asthma, and lead poisoning. As each story is different, and there are different ways to solve the problems, each trip through the Inside Stories can be very different. 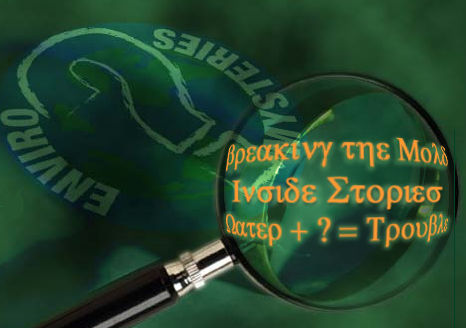 EnviroMysteries is a great introduction to various environmental and health issues. Every module and lesson comes with complete lesson plans, teacher resources, and student handouts and assessments. 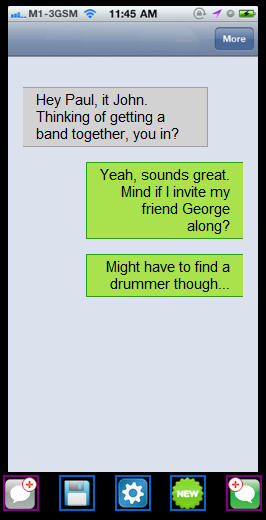 This is a fun little tool that allows students to create fictional text message conversations between fictional or historical characters. The Classtools SMS Generator does not require students to register or log in and is fairly simple to use. Simply click on the left hand text bubble icon (gray) to initiate the conversation, then on the right hand text bubble (green) to reply. Once finished, students can save their conversation to the Classtools server (with a password and unique URL for further editing) or by clicking on the sprocket icon, they can get an embed code, direct link, or QR code for sharing. The Classtools SMS Generator is great way to get students thinking about how historical or fictional figures would be thinking and having conversations themselves, as well as providing a unique alternate assessment tool to check for understanding of text or events. Imagine Romeo and Juliet’s conversations if they were only texting! Show: A New Way to Look at the World is a fantastic interactive site that takes demographics and societal data and displays it in a unique way for the United States, Japan, and the world as a whole. Show would be a great resource for not only history and social studies classrooms (It’s a sociological goldmine!) but also geography and math classes as you can use the data, correlations, and spatial relationships to interpret the maps. Begin using Show by choosing the region you wish to view, either the United States or Japan (divided by states and prefectures, respectively) or a world map that will deal with countries. You can then choose a category for study, whether they be broad concepts such as basic demographics (population, language, religion, etc. 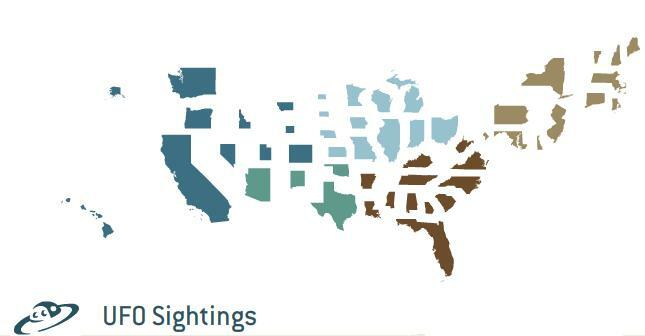 ), more specific concepts like natural resources, GDP, and education, to the more unique categories like distribution of Wal-Marts and number of UFO sightings. Take some time to explore before you try using this unique resource in class or have students use it during a free period or as a different way to research. I got lost in the maps on Show for quite a long time myself and still haven’t seen half of it!